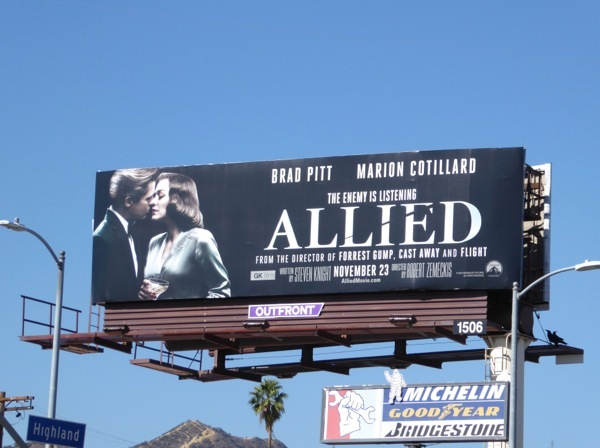 With a steamy ad creative like this for his new movie, it's no wonder Brad Pitt is dealing with accusations of cheating on his wife Angelina Jolie with his co-star Marion Cotillard and facing a high-profile divorce. 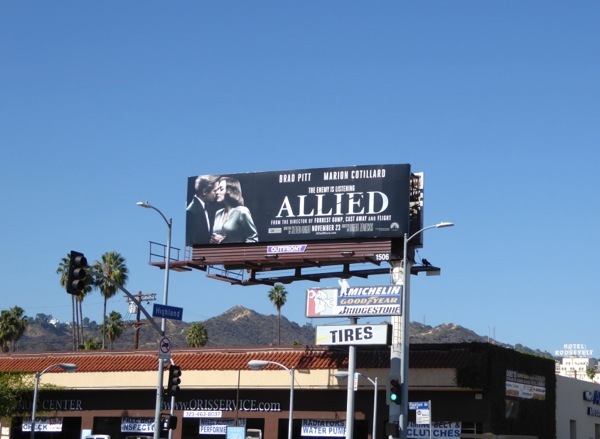 But here's the thing, they're called actors for a reason and they are just very good at portraying two people who share a passionate bond for their new WWII movie, Allied. 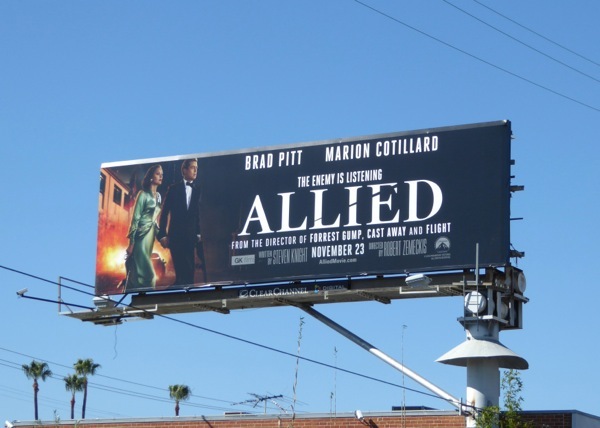 Directed by Robert Zemeckis, the wartime romantic thriller is set in 1942 Casablanca and London, and sees Pitt's Canadian intelligence officer meet Cotillard's French Resistance fighter in North Africa on a deadly mission behind enemy lines. 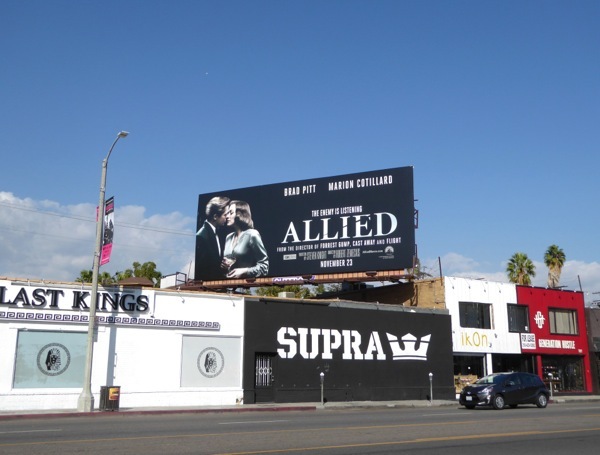 Back in London their relationship is tested by wartime pressures, but at least they'll always have cocktails, fabulous gowns and classic tuxedos. 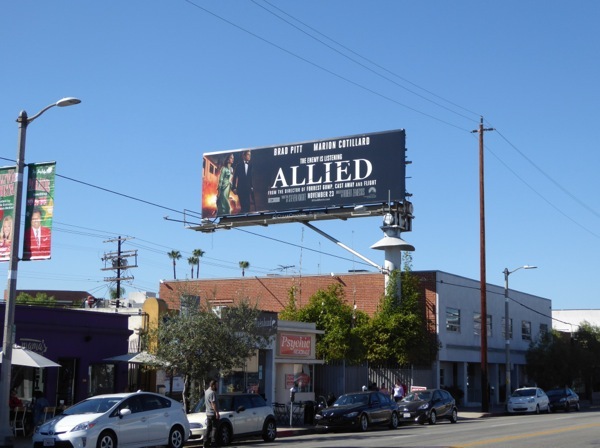 These Allied billboards, trying to evoke those iconic Hollywood movies which starred the likes of the legendary Bette Davis, Ingrid Bergman and Humphrey Bogart, were spotted along the Sunset Strip, 3rd Street, Melrose Avenue, Santa Monica Boulevard and Highland Avenue at the beginning of November 2016. 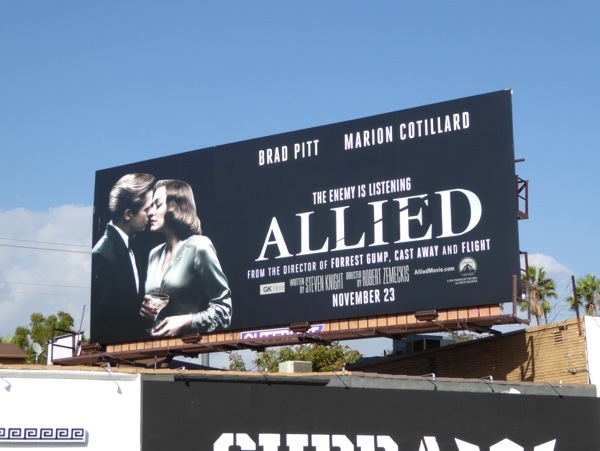 Admirers of Brad Pitt can also check out his Inevitable Chanel No. 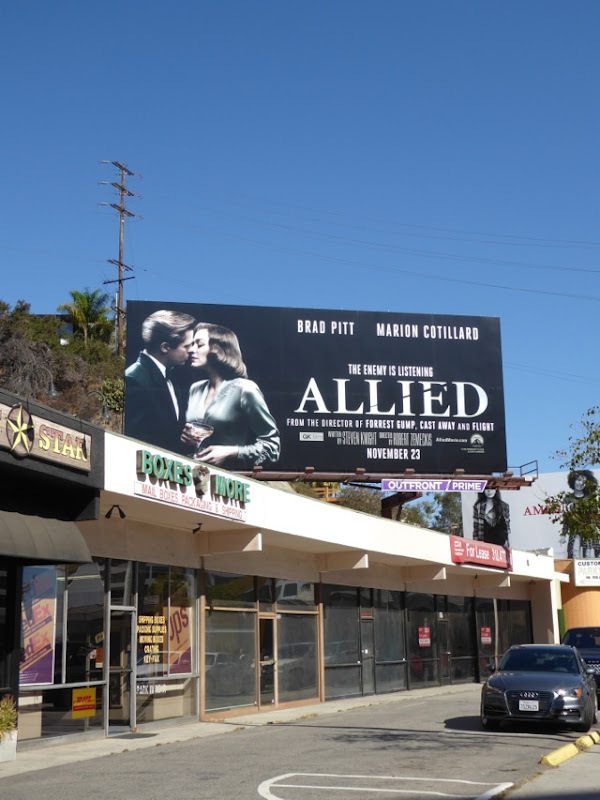 5 fragrance billboard, these Moneyball movie billboards and these Fury film billboards, whilst fans of Marion Cotillard can see more of her in these Contagion movie billboards. 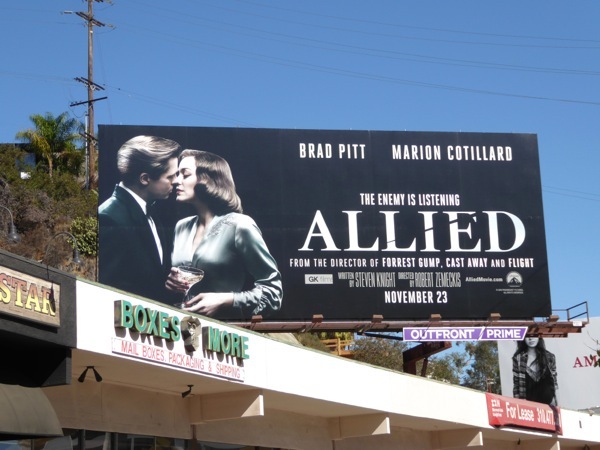 This Thanksgiving it looks like there'll be a battle to win the box office, with Allied taking on the likes of Bad Santa 2 and Disney's Moana. Can the spy drama outfox the competition to win the day (or the long weekend)? 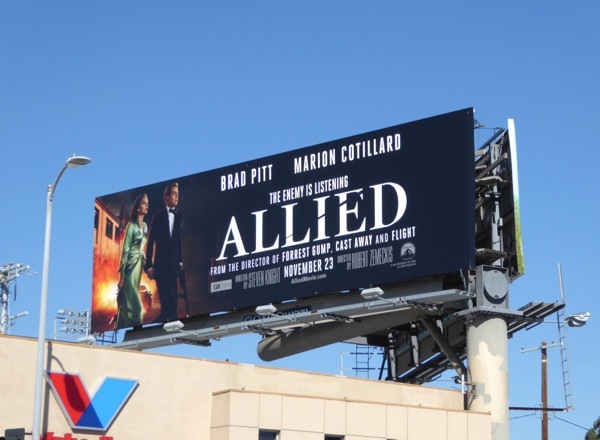 UPDATED: Be sure to also check out these costumes worn by Brad Pitt and Marion Cotillard in Allied on display.